Sun and clouds mixed. High 67F. Winds WNW at 10 to 15 mph..
Cloudy skies. Low around 50F. Winds WNW at 5 to 10 mph. Solvang’s statue of the Little Mermaid at the corner of Mission Drive and Alisal Road is a copy of the original that sits at the edge of Copenhagen’s harbor in Denmark. The famous statue in Copenhagen’s harbor may be Denmark’s top tourist attraction. She perches atop a rock in the heart of Solvang, gazing over the bustling little city. Solvang’s statue of the Little Mermaid, a half-size bronze replica of what may be Denmark’s top tourist attraction, sits at the northwest corner of Mission Drive (Highway 246) and Alisal Road. 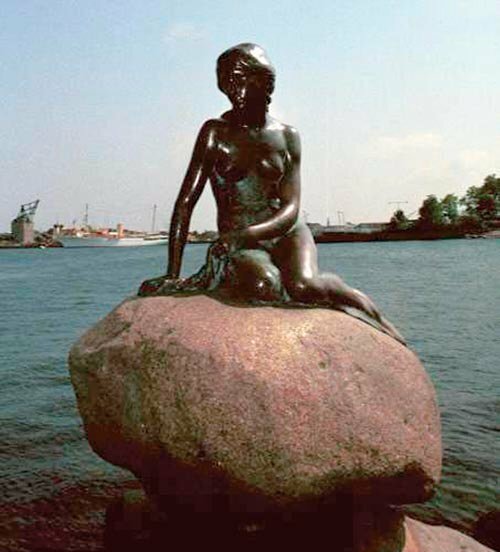 The famous statue in Copenhagen’s harbor commemorates the sad little Hans Christian Andersen tale of the mermaid who gave up everything for the hopeless love of a prince. 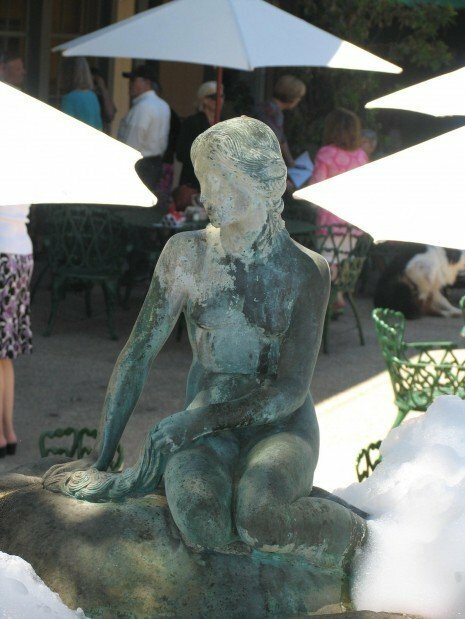 Solvang’s replica was obtained by Earl and Dolores Peterson, owners of Denmarket Square, where the Little Mermaid sculpture stands, surrounded by a fountain and small, brick reflecting pool. The Little Mermaid statue, shaded by sycamores, has stood in Solvang since 1976. It recently was dedicated as part of Solvang’s Heritage Trail in honor of the city’s current centennial celebration. variously as melancholy and wistful, Solvang’s statue periodically gets a somewhat less respectful reception with soap suds dumped in the reflecting pool. Still, it’s less than its Copenhagen counterpart has endured since it first went on display in 1913. The sculpture was commissioned in 1909 by Carl Jacobsen, son of the founder of the Carlsberg Breweries, who was fascinated by a ballet based on the 1837 Andersen fairy tale danced by ballerina Ellen Price. He asked her to model for the statue created by sculptor Edvard Eriksen. Today, the Little Mermaid also is seen in the logo of the city of Solvang, which celebrates its Danish heritage this weekend with its 75th annual Danish Days celebration. Festivities begin with a torchlight parade Friday night followed by the opening ceremonies and a street dance. Saturday, there is an aebleskiver and medisterpolse sausage breakfast, an aebleskiver-eating contest and Danish Days parade. There also is free entertainment throughout the community. Sunday offers more aebleskiver and sausage. A children’s parade is followed by a closing ceremony. Roadside Attractions is a weekly chronicle of sights along the Central Coast’s main commuter routes. Sally Cappon can be reached at sjcappon@aol.com.